Clinical research for bronchitis mainly focuses on medications and their effectiveness on clearing partially blocked airways with the least amount of side effects. The majority of studies have to do with chronic bronchitis since this is a serious and potentially fatal disease. If you have suffered from repeated bouts of acute bronchitis or have been diagnosed with chronic bronchitis, there is most likely a bronchitis clinical trial that would benefit from your participation. Please review the list of current bronchitis clinical trials and contact us if any of them interest you. If you qualify the clinical trials are at no cost to you. Bronchitis occurs when the mucous membranes of the airways carrying air into the lungs become inflamed. There are two main types of bronchitis – acute and chronic. Acute bronchitis is often accompanied by the common cold or the flu. In 90% of the cases it is caused by a virus and generally only lasts a few weeks. Other symptoms include cough, congestion and sore throat. Chronic bronchitis lasts from three months up to two years. It is due to an injury to the airways most often a result of smoking. 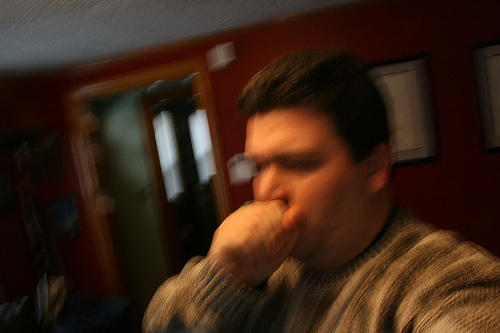 Coughing, shortness or breath and wheezing are symptoms of chronic bronchitis. Treating acute bronchitis can help relieve its symptoms. Treatments include anti-inflammatory drugs, decongestants and cough suppressants. Since most cases are viral antibiotics will not have any effect and are not generally prescribed. The more serious chronic bronchitis is treated with inhaled corticosteroids that reduce inflammation in the airways. Sometimes oxygen is also prescribed although this can lead to a dependency on the oxygen and a weakening of the respiratory drive. If the patient is a smoker the most effective chronic bronchitis treatment is to quit.